The Presidential election of 2016 was an election like no other in United States history. The typical banter between candidates became a mudslinger’s paradise, even pulling the voting public into the volatile candidate fracas. Many times they became active participants in the hostile demonstrations, and at times violent protests, between Democratic and Republican supporters. Were the candidates solely to blame for the political wedge driven between the supporters of these two political parties, or was something else partially responsible? What effect did cable television, talk radio and social media have upon the candidates, their political party platforms and on those who decided to fully support a Liberal or Conservative platform? If it’s not social media where seniors get their information from, could it be from cable TV news and talk radio? Klein reports, “More than a third of Talk Radio listeners are over age 65 and half of Fox News’s audience is over 68.” She further details, Trump won 53 percent of voters ages 65 and over, but only 37 percent of voters 29 and younger.” With this information, is it safe to conclude polarizing Conservative material is predominantly broadcast to seniors via cable TV news and talk radio whereas most of polarizing Liberal comments are sent via social media? If this is true, what will occur in future elections, when those more dependent upon cable TV news and talk radio for their political information, the Traditionalist and Baby Boomer generations, as indicated by the Center for Generational Kinetics, give way to the Generation X, Y & Z populations? 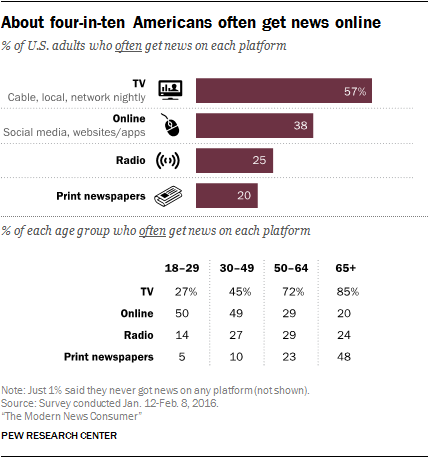 A July 2016 article in The Modern News Consumer titled, About four-in-ten Americans often get news online, indicates the sharp disparity between the four main age groups, 18-29, 30-49, 50-64 and 65+ on how they often get news via TV, online, radio and in print newspapers. 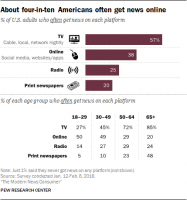 Television is relied upon a great deal more in the 50-64 and 65+ age groups, almost 28 percent to 40 percent more than the 30-49-year-old group. Radio and print newspaper interest drops significantly in the 18-29-year-old group. What happens as Generation X members retire and become more sedentary? Will they increase their online viewing and communication due to the fact TV broadcasting is declining at a rapid rate? Will Generation Y & Z members depend solely upon social media for their information? It appears the driving force in the last presidential election was the tremendous influence of cable TV news and talk radio upon the senior population. Generation X, Y & Z populations were influenced more by social media sites. All sites influenced the political polarization of our Nation. The information sites and platforms of communication will change as technology changes, creating further political communication issues in the future. Cable TV may become a thing of the past. Seniors of today and their social problems and situations will differ as each younger aging population group reaches 65 years of age. Seniors came out to vote in force in this past election. Other voting populations were less enthusiastic. As our senior populations morph from Traditionalist and Baby Boomer to Generation X,Y and Z in the very near future, economic, health and environmental issues will hold greater meaning and possible volatility to them personality as time moves on. Will the social media sites pick up the slack left by cable TV news and talk radio and continue the practice of polarized broadcasts dividing our nation’s voters, communities and families? Only time will tell.